Newly designed and just posted. LINK HERE to the class page, information reproduced below. Whether you are concerned about home invasion, or understand that in any high threat situation your are likely to encounter structures that will require a tactical solution, you need to understand how to deal with structure entry and clearance. Whether operating alone, with a partner, or with a tactical team, you need this class. The Max Velocity Tactical Close Quarters Battle Course (CQBC) is a rigorous full spectrum training program over 3 days, designed to take the student from the basic fundamentals of dynamic entry through advanced close quarters battle techniques that are taught, trained and utilized by elite military and law enforcement units throughout the world. This is not a check the block course, situational training exercises immerse the student into real world scenarios that provide essential feedback through the use of Universal Training Munitions (UTM), while keeping each and every student in a safe and controlled environment. 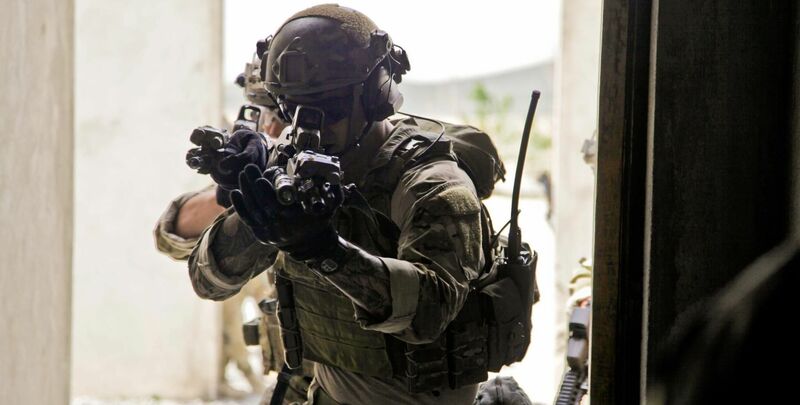 Upon completion of the course students will know how to properly execute; movement to an objective; move, secure and clear hallways; single room entries; multiple room structures, and multiple building objectives, with unparalleled tactical confidence. This is a stand alone course, (no prerequisite required) and is designed for every student’s technical and tactical abilities, so that regardless of your current training level you will be pushed and trained to the point of personal tactical growth. The class involves live fire individual skills in a flat range setting, and UTM rounds for force on target and force on force training and scenarios. NO MVT training prerequisite required. If you have not taken Combat Rifle Skills or Combat Team Tactics, you will be at a disadvantage for efficient weapons manipulation. However, safety and skills are built from the ground up over this 3 day class. The Primary Instructor (PI) for this class is John. (Info: MVT Team: Cadre Page). John can be reached on the MVT Forum as John3X. Dynamic Entry & Advanced CQB Techniques. Clearance Drills 2 thru 4 man teams. $320 additional cost for the supplied UTM rounds. Total class cost including UTM ammo: $970. No alumni discounts apply to this class. AR15 rifles only. Your bolt will be replaced by a supplied UTM blue bolt. Ensure your AR15 is ‘broken in’ and reliable. Empty magazines x 8 – you will be required to put a band of blue tape on the magazines. Barrels and chambers pulled through / rodded CLEAN & DRY – no oil/lube. Other working parts lightly oiled. UTM approved masks / goggle combinations can be supplied. Preferably: appropriate gear brought by students (see below, recommended). UTM Man Marker Rounds rounds will be supplied. Ballistic Eye Protection: You must wear some type of ballistic goggle or alternatively ballistic eye protection that leaves no gaps / is sealed to your face. Appropriate goggles include military issue / approved. Also, for example, Wiley X offers a number of goggle products (meeting or exceeding military standards). You cannot take any risks with your vision, so make sure your eye protection is adequate. Simple wrap-around shades do not suffice. Fogging is sometimes an issue with goggles, the biggest bugbear for students, so whatever you choose to bring, ensure you use an anti-fog treatment. An outer layer of BDU style clothing is recommended. 2 layers of loose clothing is recommend by UTM, but not required. No exposed skin is a mandatory rule. Military style helmet, either ballistic or bump, solid with no gaps / holes. MVT has a number of airsoft style helmets if you don’t have your own. Body armor / plates / chest rig / tactical vest or similar to cover the chest area. Helmet: bump or ballistic style, gunfighter or ACH shape, no holes. Airsoft pretend helmets work. Facial metal mesh protector: HIGHLY RECOMMENDED. Neck protector. Purpose bought airsoft type or a shemagh or neck gater will work to protect the neck and cover up exposed parts of the head below the helmet to the rear. Hearing protection IS NOT required. 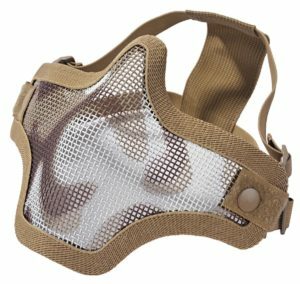 Suitable ballistic paintball helmet/google combinations are approved, so long as the holes are small enough to prevent penetration by UTM rounds. 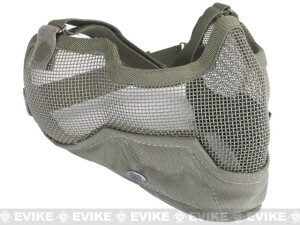 Mesh shields as shown below are sold at EVIKE.COM HERE.